The Yorkdale Condominiums is the first phase in a 100-acre master planned community located south of Yorkdale Shopping Center and north of Lawrence Avenue West. 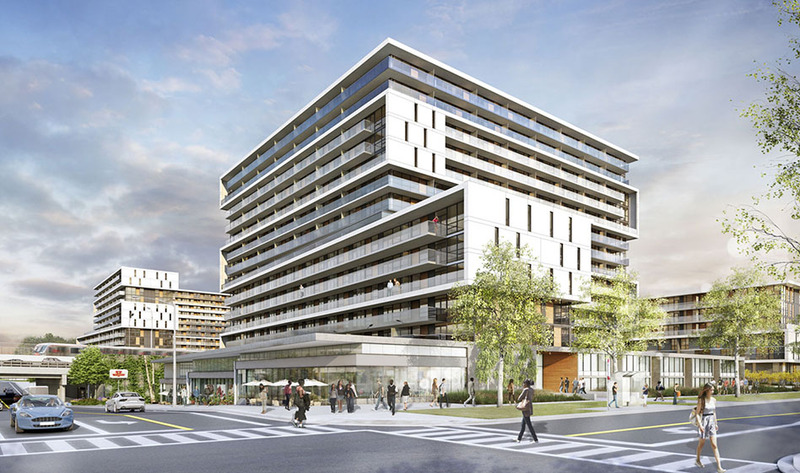 Two 15-storey buildings flank Allen Road and front onto Ranee Avenue, mere steps from the Yorkdale Subway entrance. At grade, both buildings feature retail, two storey terrace suites and amenities that look out onto new linear parks. Moving up the tower, suites are wrapped with continuous zig-zagging balconies and careful use of cantilevers that accentuate the horizontality of the architecture. Yorkdale Shopping Centre is one of Canada’s premier shopping, dining, and entertainment destinations. The Yorkdale Condominiums are the closest you can get to living in the heart of it all.